Welcome to the Nags Head Pub located in the heart of Walthamstow Village in E.17. The Nags Head pub provides the perfect location to entertain, relax and forget the stresses of modern life, combining a central Walthamstow location, on Orford Road, with a picturesque walled garden situated within the Walthamstow Village conservation area. The Nags Head is a quirky cat loving pub, so expect to see one of our feline friends wandering around the bar looking for some attention. It is great whether you fancy some quiet time to read the paper, or meet up with a group of friends. 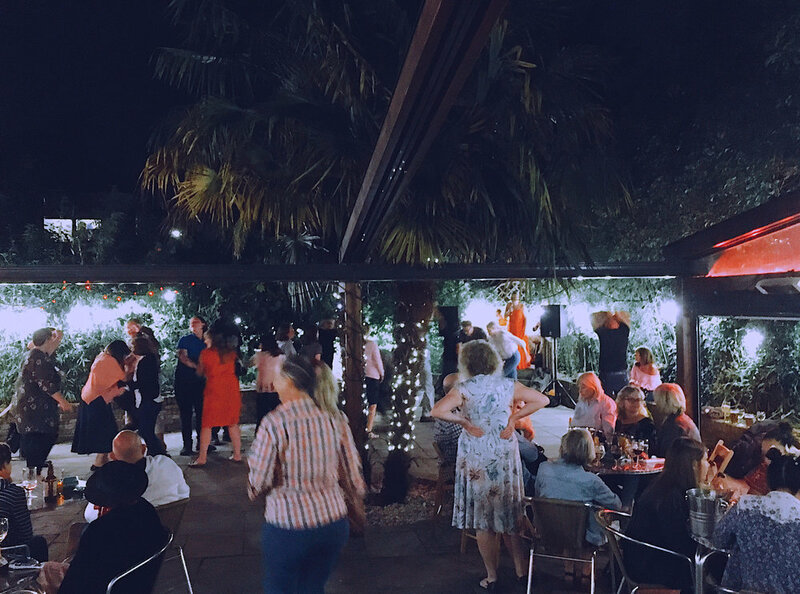 There is live Jazz every Sunday afternoon from 5.30pm with our resident band "The Stowaways"
The garden is a little haven away from it all with trees draped in fairy lights and heaters available for the more chilly nights. The bar area is reserved for over 18s only, but under 18s are more than welcome in our heated garden to the rear until 7:30pm. We offer a wide selection of real ales, lagers, wines, vegan wines and everything you would expect to see in a traditional pub and much more. There are plenty of areas to sit, relax and enjoy both inside and outside the Pub. The front has a number of tables and chairs and is a good place to watch the world go by. The garden at the rear of the pub has plenty of tables and chairs and can be accessed via the bar or down the side of the pub. You can park your bikes and pushchair's at the side entrance, there are designated bike ramps there. As you enter the bar area you will notice music playing gently in the back ground which is chosen carefully to reflect our taste. There are many tables and chairs to choose from positioned all around the centrally located bar. We have a selection of 6 ever changing real ales, these have all been sourced from local London breweries and can be found at our main bar. We stock a wide range of exciting craft cans and bottles, which can be found on display behind the bar. We are proud to introduce our wine list which contains wines selected from around the world that reflects the every changing, exciting new flavours from Old and New wine making. Enjoy, and watch out for our specials that we'll be bringing you when we feel we have discovered a wine which is just too good to miss. We now stock Vegan wines which go great with out vegan food on offer. MONDAY NIGHT: PIZZAS ONLY 6-9 PM. TUESDAY TO SATURDAY: FULL MENU. SUNDAYS: ROASTS & PIZZAS UNTIL 4:30 PM. UPSTAIRS AT MADAM LA ZONGAS. *Wine Tasting - Discover the latest trends and tastes at our informal but informative monthly Wine tastings with our resident Wine Guru Sean Pines. *Madam La Zongas Lounge Bar will be open every Friday and Saturday evening where you will be able to chill out and enjoy the atmosphere. The Landlady Flossie's Dad once had a cat named Madam La Zonga. Years later at a Boot Sale, she found a CD of 1930/40s music entitled "Serenade in the night". On it was a double-entendre track "Six lessons from Madam La Zonga" (if your ever down Havana way). She then found out it was the title of a film staring "the Mexican Spitfire" Lupe Velez whose party trick was to throw her dress over her face whilst wearing no undergarments... Unfortunately she committed suicide at the age of 36 for finding herself unmarried and pregnant. *Pop Quiz Night - Every Monday at 8pm. Hosted by Let's Get Quizzical . It does exactly what it says on the tin! £2 per peson, max 8 players per team. See poster below for more information. An entertaining and fun evening…though prepare for the deadly earworm!! Not the average music quiz.